If you pick this up expecting Atwood to teach you how to be a good writer, you will be disappointed (of course, if you expect to become a good writer simply from reading books about being a writer you have already lost the battle). This is not a manual on writing. Rather, it’s Atwood writing about how she became a writer, what it means to be a writer, and why writers do what they do. “Around the age of seven I wrote a play. The protagonist was a giant; the theme was crime and punishment; the crime was lying, as befits a future novelist; the punishment was being squashed to death by the moon. 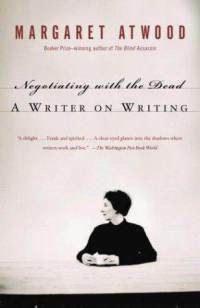 “The title of this chapter is ‘Negotiating with the Dead,’ and its hypothesis is that not just some, but all writing of the narrative kind, and perhaps all writing, is motivated, deep down, by a fear of and a fascination with mortality – by a desire to make the risky trip to the Underworld, and to bring something or someone back from the dead.